The Air Jordan 11 (XI) Retro Columbia was another classic from the 1996, but brought back and made available to the public once again. The Air Jordan XI Columbia Blue contains a dominate White upper, with Blue accents. 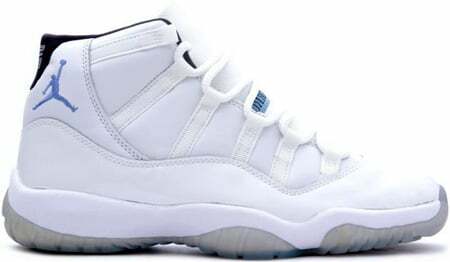 The Air Jordan 11 Retro Columbia released January 17th 2001, and at the time was a general release. Retail for the Air Jordan 11 (XI) White/Columbia Blue was $125.